The photos were taken early June and supposed to be posted last week along with the video... however, I did not manage to do so, because of .. shall we say 'teething problems' in video shooting. 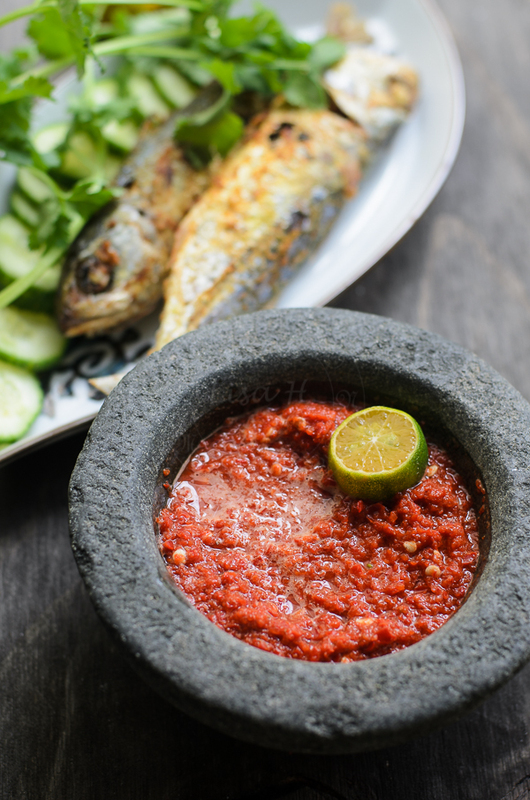 This sambal/ chilli dip is one of the must have in most Malaysian households. Its works like an appetiser, even though we usually have it alongside our main meal. 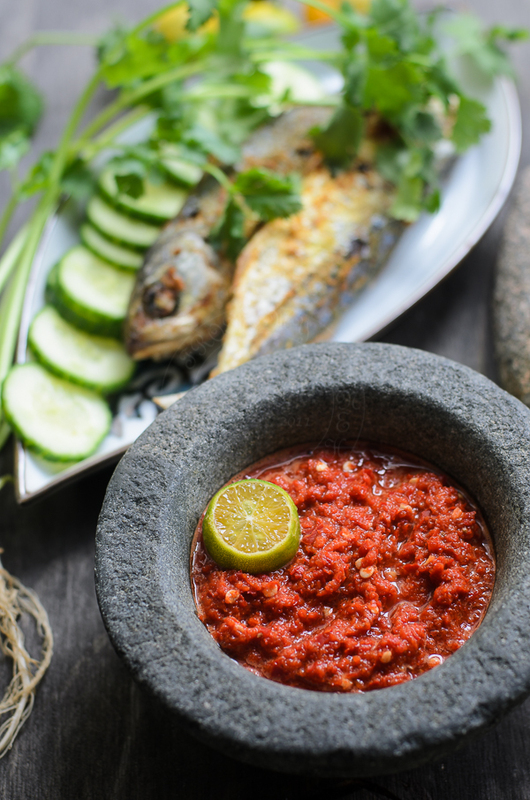 In the good 'old days', before all sort of cooking gadgets ’that makes our life easier' flooded into the market, sambal belacan was prepared by pounding chillies using mortar and pestle. I personally prefer to use food processor, less mess... to eliminate the possibility of getting my eye ‘burn’ from the odd chilli splatter... that one tiny splatter could ruin your day!!! Serve with deep fried fish, steamed rice, cucumbers and other greens. Love sambal sauce! The pan seared fish behind look pretty awesome too, Lisa. Delightfully spicy! A great accompaniment to your gorgeous pan-seared fish. 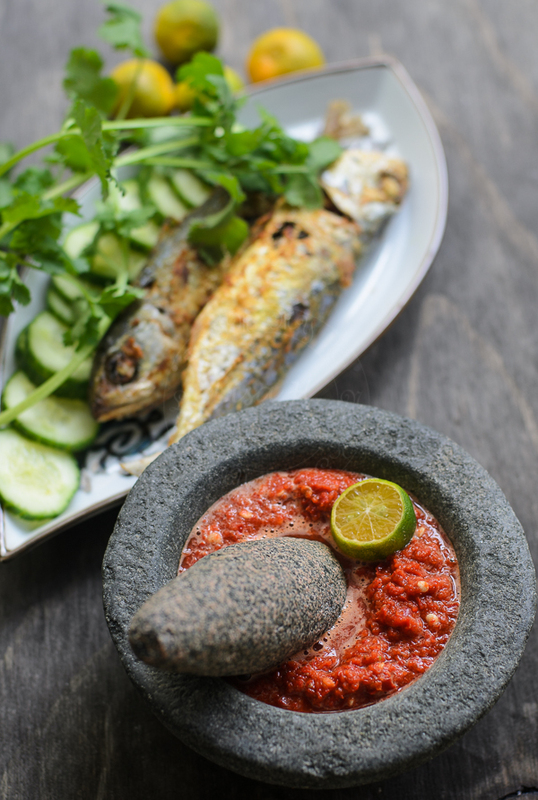 I love sambal belacan too.... love it with my fried fish on it. Sedappppp! !